Located in Twinsburg, Ohio, Mega Storage is a condominium style storage facility featuring large (17' x 41' or larger), heated units. 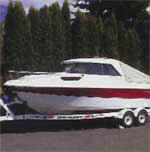 The units are designed for indoor storage of RV's, boats, motorcycles, collector cars, antiques or life's overflow. Units include electric and have gas heat available. The Mega Storage facility has gated keycard access and features a heated washbay and restroom. Units are available to purchase or lease. Click here to check availability or call 330-922-9956.